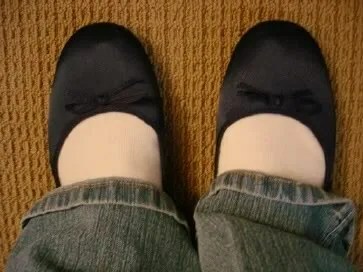 And my shoes! I found them at Urban Outfitters, of all places. Hello all! 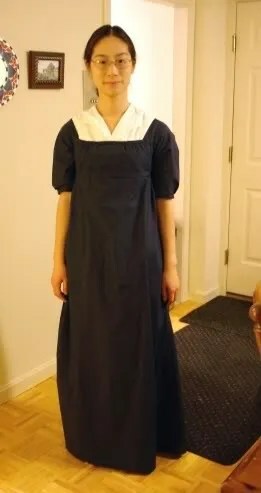 I finished up my navy blue bib front regency dress (I had to do some fiddling with the waistband), and then last week I made a chemisette to go along with it. 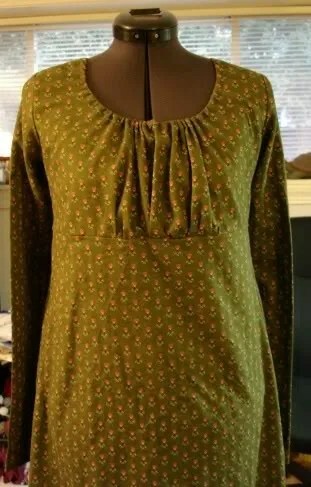 I made the chemisette using the pattern from Sense and Sensibility. 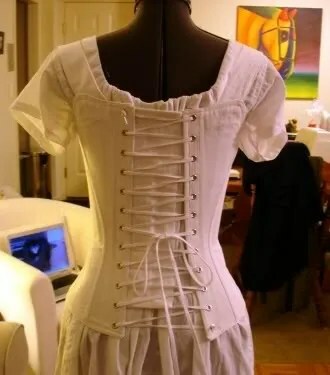 So now I have pictures of everything together, including my new, comfy stays from Period Corsets (though I still like my short stays too). Yes, I did sew a bit over the winter holiday. 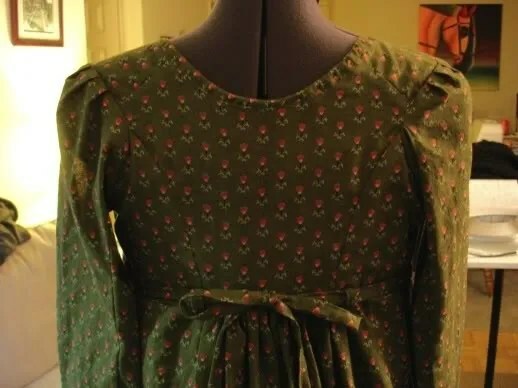 I finially hemmed everything on my green regency dress. It fits me decently, and I am happy with it. 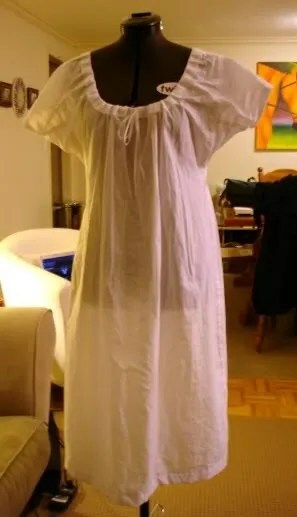 It’s the first thing I’ve finished that is above Halloween costume quality. 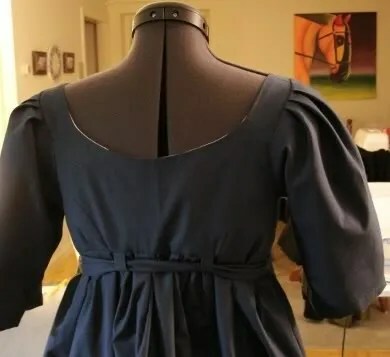 Then, I started on another dress, a bib-front regency. Mike gave me the Period Impressions pattern for Hanukkah. I managed to snag some fabric by Andover UK that is supposed to be a reproduction from the Jane Austen quilt. 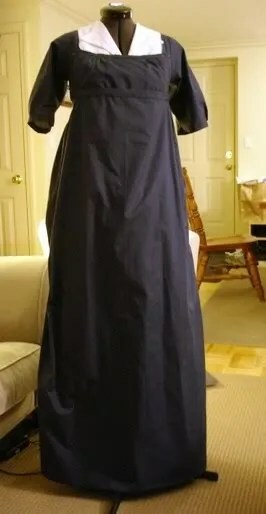 I want to make a bib front dress from this, but I wasn’t sure about my skills, so I made a full test run using some broadcloth from the stash. 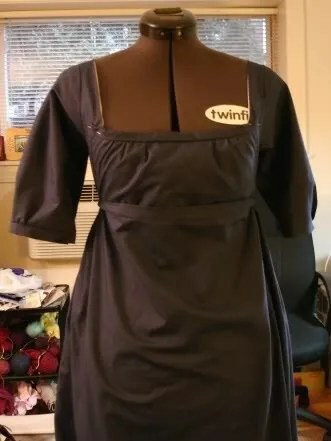 It’s almost right, but I need to do some fiddling with the side openings and made the shoulders wider. Plus understitch the lining so it doesn’t stick out so much.